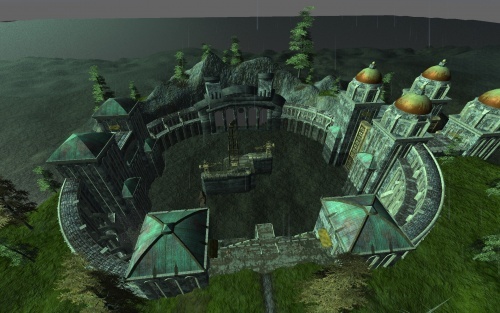 The port of Innovus, where the Ancient Port Warehouse can be found. This dungeon is located in Innovus and has a level range from 48-55. The quest begins at Kipcel, who is standing in front of the two large doors of the Ancient Port Warehouse. As reward you get a key which has to be in your inventory to gain access to the APW. When entering the APW, this will be the first part of the dungeon you need to fight through. This wing is connected directly to the entrance wing. Between the storhouse wing and the central Hub is an elevator down to the Gnome City, that offers alot of quests, crafting stations and the altar of this dungeon. This wing lies in the east part of the dungeon and leads to the summoning room, as well as the Hangar. This wing lies in the west part of the dungeon and leads to PROFESSOR VERCEL. This wing lies in the north part of the dungeon and leads to the CORE PROCESSOR. This wing leads to the final fight with KOTASOTH. Each class can obtain a unique set of armor from a NPC in Gnome City, a drop from various mobs is required, as are some crafted and diplomacy droped items. See also: Ancient port Warehouse Armor Sets. By harvesting certain bosses in APW, it is possible to gather components and most drop recipes for specific items. The results are various items from bow to breastplate. See also: Ancient Port Warehouse Crafted Items. This page was last modified on 30 August 2012, at 13:55.